Throughout history, many tea companies have started and ended. Periodically, we like to review tea companies of the past. 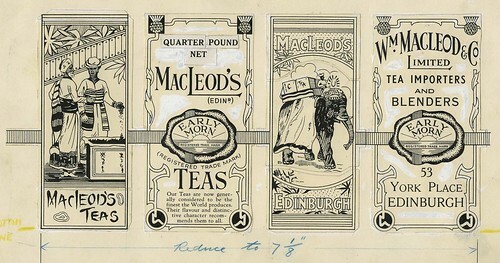 Below, is an a label for Early Morn Tea from William MacLeod & Company. MacLeod’s was located at 53 York Place in Edinburgh. I am retail manager at Dunvegan Castle, Macleod Estate in the isle of skye, I am hoping you can help with my enquiries. Does the Macleods Edinburgh Tea still exist? If not the estate would like to purchase the trademark. Is this possible and can you help with this? Ruth; We are not sure if the brand exists. You should contact a trademark attorney to help you with that. Thanks.